Thanks to a system of food deposits, we can enjoy about 170 kilometers of independent kayaking in an almost unexplored wilderness with a maze of islands and jutting headlands, before moving on to the Qaleraliq glacier, an amphitheater comparable only to the Perito Moreno in Patagonia. From there, we climb to the vicinity of the mythical Inlandis plateau, the second largest glacier in the world. Independent navigation through icebergs to reach the Qaleraliq glaciers, the Perito Moreno of the Arctic. Trekking on a glacier tongue and night spent beside the perpetual ice of Inlandis, the second largest glacier in the world. Experience 24 hours of sunlight (up to mid-July) or see the northern lights (from mid August). Three-hour flight from Keflavik (Iceland’s international airport), or from Copenhagen to Narsarsuaq (Greenland) with spectacular views of the glacier tongues and the huge southern Greenland ice-sheet… We are in the Arctic now! Welcome at the airport by our English speaking guide and an hours crossing by high-powered zodiac to the city of Narsaq. Once settled in our hostel off we go to our supply store to get kitted out with kayaks, paddles, clothing and navigation accessories. If conditions permit, we make first contact with water to get familiar with the use of the rudder. Overnight stay at the Kayak Hostel. We start the journey crossing the great fjord of Narsaq, sailing amid icebergs heading southwest toward Tuttutooq Island. The landscape is one of low mountains with waterfalls cascading into the sea and the constant presence of seals. We travel parallel to the coast, doing some trekking and sheltered by the islands until we reach the cabin of Ujaraq, a local fisherman. 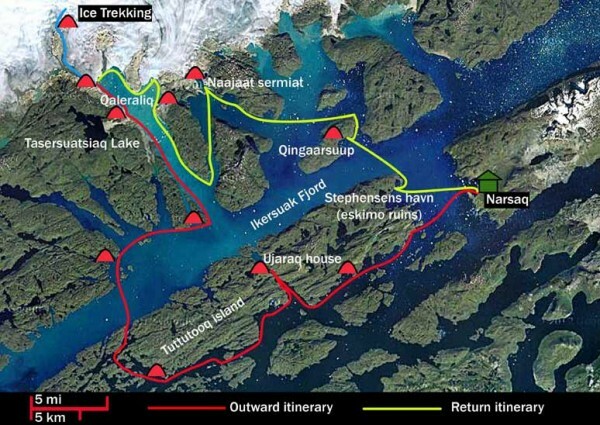 Depending on the weather and how the journey progresses, the guide will decide whether to circumnavigate Tuttutooq island or take the “shortcut” to the Qaleralliq fjord: carrying our kayaks over an isthmus for 400 meters and arriving at a point right across from the fjord that leads directly to the Qaleralliq glaciers, the Perito Moreno of the Arctic. Camping overnight. It’s really a blue iceberg! Firstly, we cross the wide Kerssuaq fjord, often plagued by ice and, with luck, visited by whales. We spend two days skirting the coast in a northeast direction through an area relatively uncharted by kayakers, approaching the mouth of the Torsukattak fjord and its islands until we reach the Qaleraliq Fjord. Camping overnight. The next stage is a beautiful 15 km sail along the cliffs before reaching the three gigantic Qaleralliq glaciers, the gateway to the 2,500 kilometers of icy plateau leading to the northern coast of Greenland. It goes without saying that the spectacle, seen and heard from our silent kayaks, is awesome! Still surprised by the intermittent roar of cracking or seracs collapsing into the sea, we set up camp on a sandy beach. After a break, we trek up to Lake Tasersuatsiaq, where we have a privileged view point of the infinite Inlandis or Greenlandic ice-cap. We are in caribou, arctic fox and hare country. Camping overnight. After breakfast and dismantling the tents, we sail to the end of the fjord, disembarking to enter the perpetual Inlandis ice-sheet. It is about four hours of hiking, enjoying the sights of the rimayas or large transverse cracks, as we reach the great moraine (mixture of ice and sediment) following our guide’s instructions. The return journey will take us back to our kayaks, where we set camp for the night. Camping overnight. The easiest and probably the most spectacular day, we travel by kayak around all the Qaleralliq glaciers to set up camp on nearby Caribou island. Camping overnight. Sermiat Naajaat Glacier … No limits! Once we backtrack Qaleraliq Fjord, we set sail in a north-eastern direction, circumnavigating the island of Akuliaruseq (also called caribou because of their presence there) to visit the two Naajaat Sermiat glaciers. This is the day we cover the most ground but by now our muscles are up to the challenge… No limits! Camping overnight. Today we head towards Qingaarsuup Island, our second last objective. We camp next to a cabin and have an easy trek up to get a unique view of Inlandis and much of the route traveled during the previous days. By now we are already expert salmon fishermen and gatherers of mushrooms and wild blueberries (from August), tasty and rich in vitamin C. Camping overnight. On our last day kayaking we weave through the Ikersuaq icebergs towards Stephensens Bay in the now familiar island of Tuttutooq. We disembark there to see the Inuit ruins of Manitsuarsuk (settlement of fishermen and hunters, inhabited until the eighteenth century). After lunch we cross to Narsaq, our starting point, where we will find being back in civilization almost exotic! Overnight stay at the Kayak Hostel. 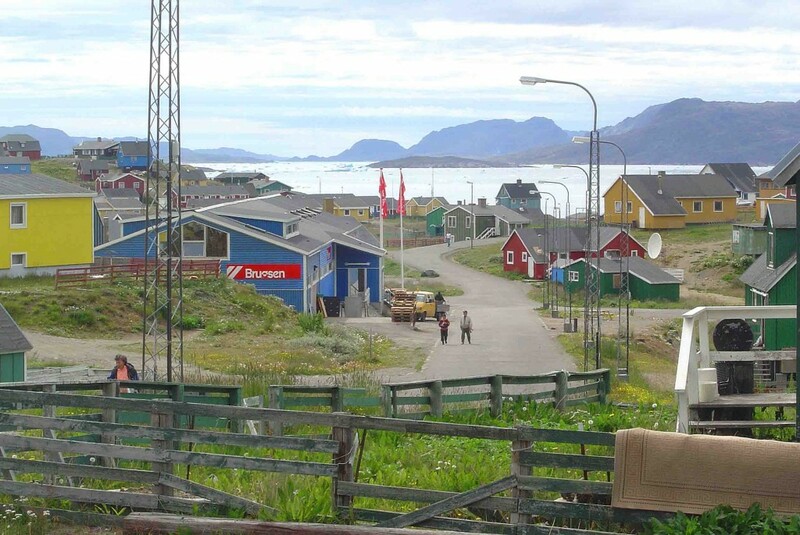 Free time to visit Narsaq town: the museum, the inuit market, the church or the leather shop. Option of a small hike to nearby mountains. Boat transfer to Qaqortoq, described as the most charming town in all Greenland. Time to take a stroll around the city, while you enjoy the beauty of its colourful buildings and the awe-inspiring landscapes. Explore on your own the museum, the fur shops, the traditional kayak club, the church or the only fountain in the country. 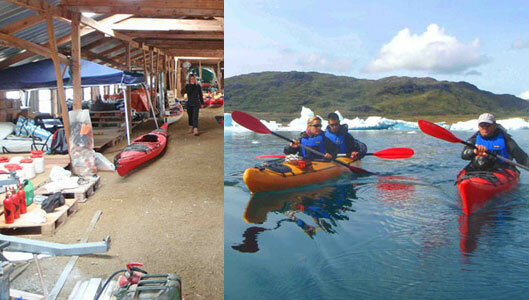 Then, we will pursue our sailing from Qaqortoq to visit the best preserved norse ruins in Greenland. We sail past the large island of Arpatsivik, the norse “Hvalsey” or Whale Island, and into the Hvalseyfjördur, where the church ruins stand in a quiet and peaceful setting. In the afternoon, boat transfer way back to Narsaq. Overnight stay at the Kayak Hostel. Boat transfer from Narsaq to Narsarsuaq, where we have time to walk around in the area or visit the Bluie West One museum, US militay base frozen in time since the Second World War. Flight Narsarsuaq-Keflavik (Iceland’s international airport) or Copenhaguen. From 13th to 27th of August. From 15th to 29th of August. From 27th August – 10th September. From Iceland (Reykjavik Domestic Airport). Flight from Reykjavik (or Copenhagen) to Narsarsuaq/return flight. Unexpected expenses as a result of weather conditions (including difficulties or cancellations due to ice or weather conditions) or flight or boat delays. Since we will be sailing in an area of calm water and because of the stability of our double kayaks, previous experience in kayaking is not required (although is recommended). The pace of the crossing is moderate and a specific physical level is not required. If you want to know more details of the trip (passenger information, payment method, recommendations, equipment, etc.) please ask for the Trip Details.